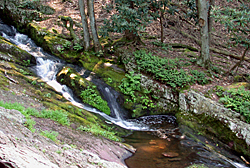 Buttermilk Falls: Height: 75 ft.
Buttermilk Fall is visible from gravel Mountain Rd., south of Walpack Center. Cascading 75 feet down the face of Kittatinny Ridge. it is the highest waterfall in New Jersey. The blue-blazed Buttermilk Falls Trail begins as a wooden stairway that climbs to the top of the falls. Platforms provide spectacular views. Silver Spray Falls: Height: 45 ft. Magical Silver Falls, located south of Walpack center is one of New Jerseys best kept secrets and the trail to the falls is difficult to find. To reach Silver Spray Falls, drive 1 mile straight through Walpack Center, down a hill, and across a bridge to the intersection at the cemetery. Turn right. Continue 1.3 miles. On your right is Silver Spray Farm, whose pastures in the 1920s were filled with dozens of dairy cows. Park at the abandoned Silver Spring Farm and head North on Mountain Road about 500ft. An unmarked trail leads to the falls from Mountain Road. The falls are situated in a stream valley of hemlock and rhododdendron along a tributary of Flat Brook. Stony Brook: Height - 15 ft. There are two falls along Stony Brook as it winds toward Big Flatbrook. Walk or ride downstream on the Silver Mine Trail from the Picnic Area at Kittle Field. The upper falls run through a gap in a stone wall, probably the remains of a mill. Downstream, the lower falls cascade down a series of shale steps. At the Tillman Ravine Natural Area, the rushing waters of Tillman Brook carve a gorge through slopes of eastern hemlock, mountain laurel and ferns. Hiking trails wind through this spectacular ravine (no biking). providing views of a series of cascading waterfalls. After your bike ride on the Stokes State Forest trails, take the time to explore this beautiful natural area. In the summer, the air in the ravine is decidedly cooler. Access is from a parking area at the southern end of Stokes State Forest.